It has been more than 10 years (we celebrated our 10th anniversary last year!) 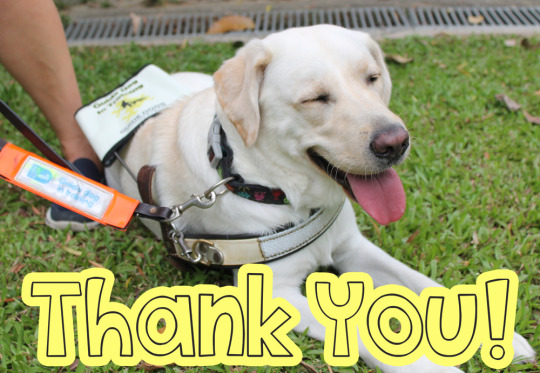 since Guide Dogs Associations of the Blind’s inception, and we are proud to have, among our achievements, set the foundation for acceptance of guide dogs in Singapore, and provide quality mobility training and aids for Visually Impaired people. 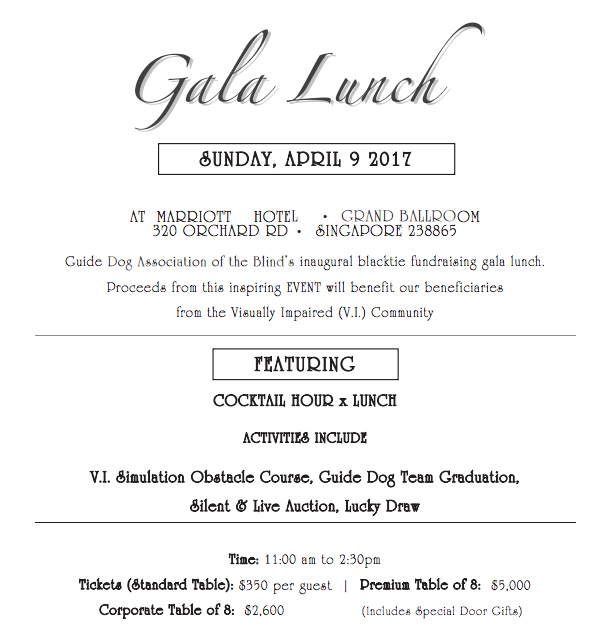 To celebrate our achievements and also the graduation of yet another guide dog team, Loo Lan and her guide dog, Ria, GDAB is hosting a Fundraising Gala Cocktail and Lunch Reception in conjunction with International Guide Dogs Day on Sunday, 9th April. GDAB, along with our beneficiaries and directors, would like to invite your support and participation to our Gala Lunch to celebrate and commemorate our achievements, which was only made possible with your belief in our cause. If you would like to purchase tickets, be a sponsor, or donate to us (lucky draw prizes, door gifts, cash), download the form here: http://www.guidedogs.org.sg/wp-content/uploads/2017/02/Sponsorship-Package-2017.pdf. Sign up closes on 9 March 2017. Thank you for your support throughout this journey with GDAB. With your help, we were able to give the gift of independence and mobility to our beneficiaries, simultaneously returning to them a sense of safety while travelling, and purpose. We were able to transform stories of tragedies to hope and inspiration, and most of all, we were able to show people that anything is possible with the correct support and mindset. We hope to see you there!